Pegasus Suites a new luxurious complex built in 2003, is snug into the cliff of Imerovigli village, next to St Nikolaos Byzantine monastery, overlooking the sea and the old crater of the volcano. 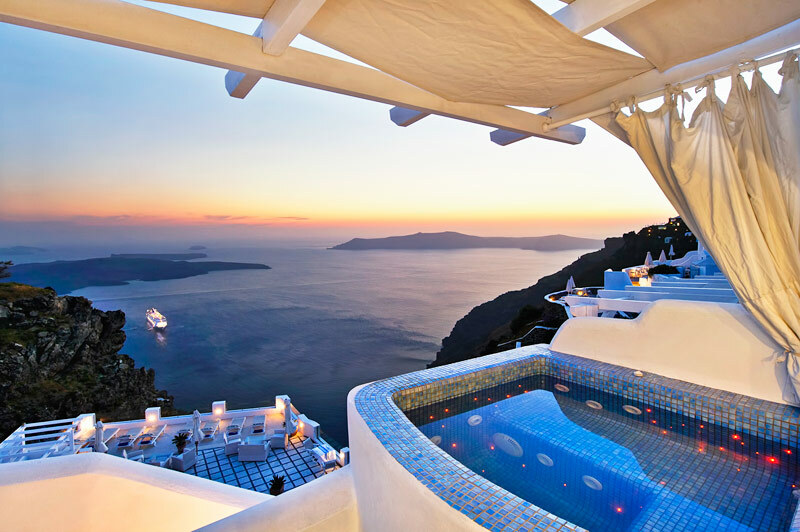 The altitude is at 330 meters offering a direct view to the volcano, the Aegean Sea and the amazing Santorini sunset. Pegasus is only 1 km away from Fira, the island capital. It consists of apartments and suites decorated and furnished in the traditional Cycladic architecture with antiques and old furniture. Standard Studio: Double bed, sitting area, bathroom with shower, terrace with sea view. Can accommodate up to 2 persons. Superior Studio: Queen bed, sitting area or living room, bathroom with shower, balcony or terrace with sea view. Can accommodate up to 3 persons. Junior Suite: Queen bed, sitting area or living room, bathroom with Jacuzzi bathtub or bathtub or shower, private balcony or terrace with sea view. Can accommodate up to 3 persons. Classic Outdoor Jacuzzi Room: Queen bed, sitting area, bathroom with shower, balcony with sea view and an outdoor heated Jacuzzi. Can accommodate up to 2 persons. Pegasus Suite: Located on the fourth level of the complex, spacious bedroom with four posted bed, large living room, marble bathroom with Jacuzzi Bathtub, private balcony (15 sq. m.) with an outdoor heated Jacuzzi and sun loungers. Can accommodate up to 2 persons. Cave Suite: Two spacious bedrooms, two bathrooms, one with Jacuzzi bathtub, WC, living room, dining room, office corner, large veranda with an outdoor heated Jacuzzi. Can accommodate up to 5 persons. Vergina Suite: Located on the second level of the complex, bedroom with a queen size bed, large living room with a Santorinian sofa bed, bathroom with Jacuzzi bathtub, an outdoor heated Jacuzzi and a spacious terrace with two sun loungers overlooking the caldera. Decorated in a combination of blue and white colors. Can accommodate up to 3 persons. Velerefontis Junior Suite: Located on the third level of the complex. Queen size bed, small sitting area, bathroom with shower and mosaic, an outdoor heated Jacuzzi and a private balcony (11,5 sq. m.). Can accommodate up to 2 persons. Sky Junior Suite: Located on the first level of the complex, decorated in a contrast of blue and white, queen size bed, living room with built-in sofa, mosaic bathroom with shower in jeweled tones of blue, private balcony (14 sq. m.) with an outdoor heated Jacuzzi and sun loungers. Can accommodate up to 2 persons. Dionisos Suite: Suite 55 sq. m. in the fourth level of the complex, decorated in the colors of Santorini. A spacious bedroom with a four posted bed, large living room with a Santorinian sofa bed, all marble bathroom with Jacuzzi bathtub. Private balcony 11,5 sq. m. with an outdoor Heated Jacuzzi overlooking the caldera. Can accommodate up to 2 persons. Golden Junior Suite: Located on the first level of the complex, decorated in a combination of Cycladic and modern way. Queen size bed, mosaic golden bathroom with shower, private balcony (23 sq. m.) with an outdoor heated Jacuzzi and two sun loungers. Can accommodate up to 2 persons. Trireme Suite: Located onn the second level of the complex. Spacious living room with a Santorinian sofa bed, bedroom with queen size bed, marble bathroom with Jacuzzi bathtub, private balcony (17 sq. m.0 with an outdoor heated jacuzzi and two sun loungers overlooking the caldera. Can accommodate up to 3 persons. Achilleas Suite: Located on the second level of the complex, decorated in a combination of blue and white. Queen size round bed, living room, marble bathroom with Jacuzzi bathtub, private balcony (25 sq. m.) with two sun loungers and an outdoor heated Jacuzzi. Can accommodate up to 2 persons. Golden Junior Suite (up to 2 persons): Suite 31 sq. m. in the first level of the complex, decorated in a combination of Cycladic and modern way. Sitting area, kitchenette, a Queen Size bed, a mosaic golden bathroom with shower. A private balcony 23 sq. m. with an outdoor Heated Jacuzzi and two sun loungers. Achilleas Suite (up to 2 persons): Suite 38 sq. m. in the second level of the complex, decorates in light lilac and silver colors. Queen size bed, living room, kitchenette, all marble bathroom with Jacuzzi bathtub. Private balcony 25 sq. m. with two sun loungers and an outdoor Heated Jacuzzi. Vergina Suite (up to 3 persons): Suite 45 sq.m., in the second lever of the complex, Bedroom with a Queen size bed, large living room with Santorinian Sofa bed, kitchenette, bathroom with Jacuzzi bathtub, an outdoor Heated Jacuzzi and a 21 meters terrace with two sun loungers overlooking the caldera. Decorated in a combination of blue and white colors. Pegasus Suite (up to 3 persons): Suite 55 sq. m. in the fourth level of the complex, spacious bedroom with four posted bed, large living room and antique furniture. All marble bathroom with Jacuzzi Bathtub, kitchenette, private balcony with outdoor heated jacuzzi. Dionisos Suite (up to 2 persons): Suite 55 sq. m. in the fourth level of the complex, decorated in the colors of Santorini. A spacious bedroom with a four posted bed, large living room with a Santorinian sofa bed, kitchenette, all marble bathroom with Jacuzzi bathtub. Private balcony 11,5 sq. m. with an outdoor Heated Jacuzzi overlooking the caldera. Trireme Suite (up to 3 persons): Suite 45 sq. m. in the second level of the complex, decorated in light colors. Spacious living room with Santorinian sofa bed, kitchenette, bedroom with a Queen size bed, all marble bathroom with Jacuzzi bathtub and an indoor Jacuzzi overlooking the caldera. Private balcony 17 sq. m. with two sun loungers. Presidential Suite (up to 5 persons): Two spacious bedrooms, two bathrooms: one with Jacuzzi bathtub, WC, living room, dining room, office corner, large veranda, kitchenette, Traditional Santorinian antique furniture. All types of rooms include Air-Condition, Satellite TV, in room safe deposit boxes, mini bar, hair dryer, jacuzzy in all suites, individual CD player and radio, free ADSL access, bathrobes, slippers ,pool and beach towels, direct dial phone, luxury cotton-satin bed linens in suites. The guests of Pegasus Suites can all enjoy the beautiful outdoor swimming pool or visit the outdoor jacuzzi. Have a snack at the snack bar, or get comfortable and request for a massage. Pegasus Suites offers many services, like night service in all the suites, a travel desk and car rental and of course bell boy service.